Happy June! The year is half over with - crazy how fast it has gone by. We've gone 6 months with sticking to the dinner meal plans and it really has been helping our finances, even with increasing our grocery budget. 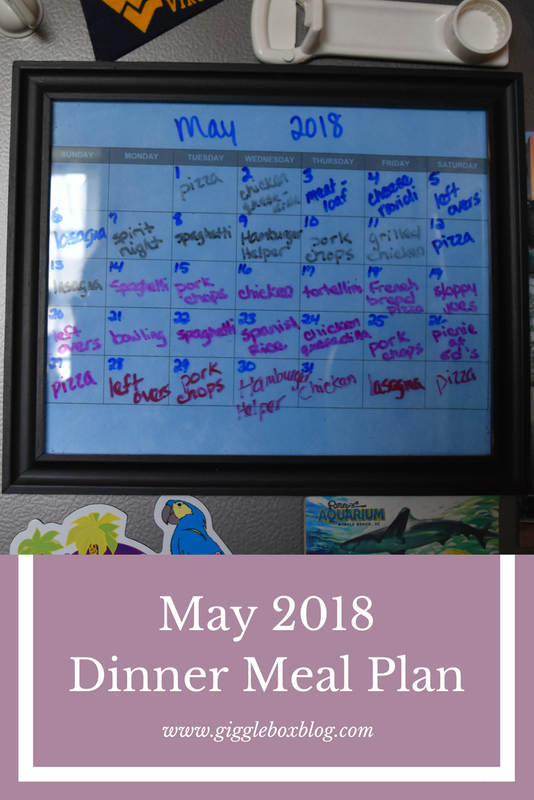 Here's what we had for dinners for the month of May. As I've said the past several months, having the meals written down in a central location so the whole family can see them is extremely helpful. Want to make a dry erase calendar of your own? Read my post DIY Dry Erase Calendar to learn how. Below is the list of all the dinners planned. If I have the recipe on the blog, there will be a link to that post. 3. meatloaf - This was my grandma's recipe (coming soon to the blog), but I do have another recipe on the blog, Paula Deen's Barbeque Meatloaf. 6. lasagna - This was a frozen lasagna, but I do have a homemade recipe here on the blog, Lillian's Lasagne. 19. sloppy joes - These were made from a can, but I do have a homemade recipe here on the blog, Kathy's Sloppy Joes. There you have it. Hope this helps give you an idea of what to plan for your next dinner. I try to make simple and fairly inexpensive meals because of being on a tight budget and I don't really like cooking all that much. What are some of your go to recipes? I'm always looking for new simple recipes to add to our rotation. Since I've also started back with posting our weekly grocery hauls, I decided to link up all the posts below. This way you can see what all was purchased and what meals they were purchased for.